Hi! 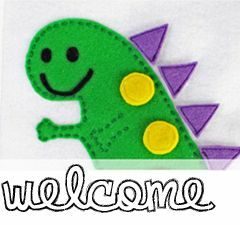 Welcome to the first post ever on the Quiet Book Blog. 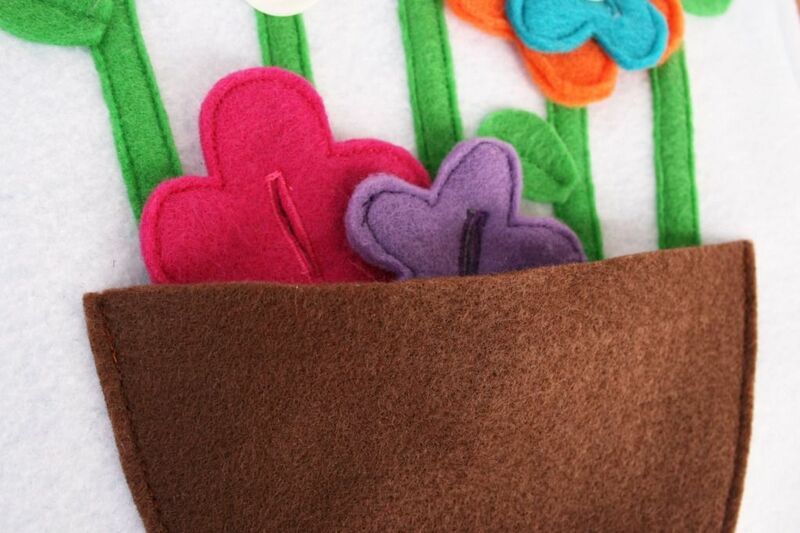 This blog is meant to be a resource to all those planning and making their own quiet books. I decided to start this site after all of the interest and questions I've gotten on my family blog about the quiet book I made last year. I plan to regularly feature different people's quiet books, with pictures and answers to questions on the process. Hopefully as I post different people's quiet books and their interview questions on how they made them, you'll be able to benefit from their experiences! My name is Jocelyn. 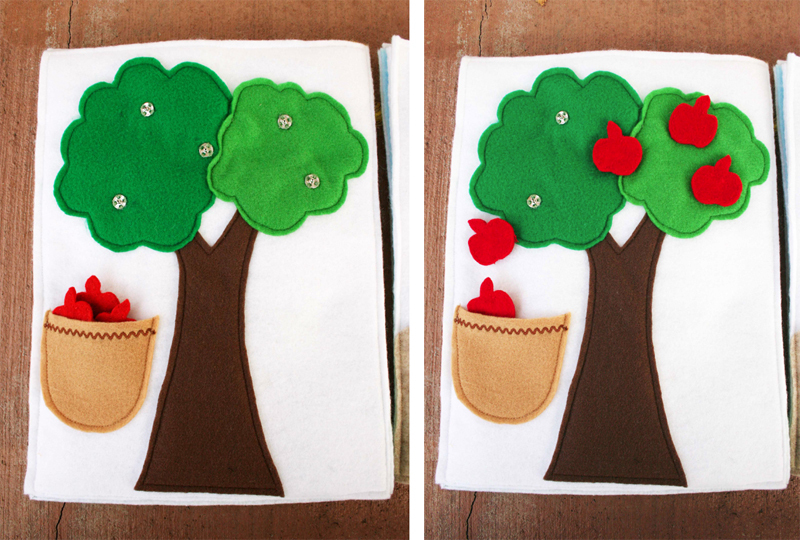 I'm a homemaker in my early twenties who loves nature, books, and making things. 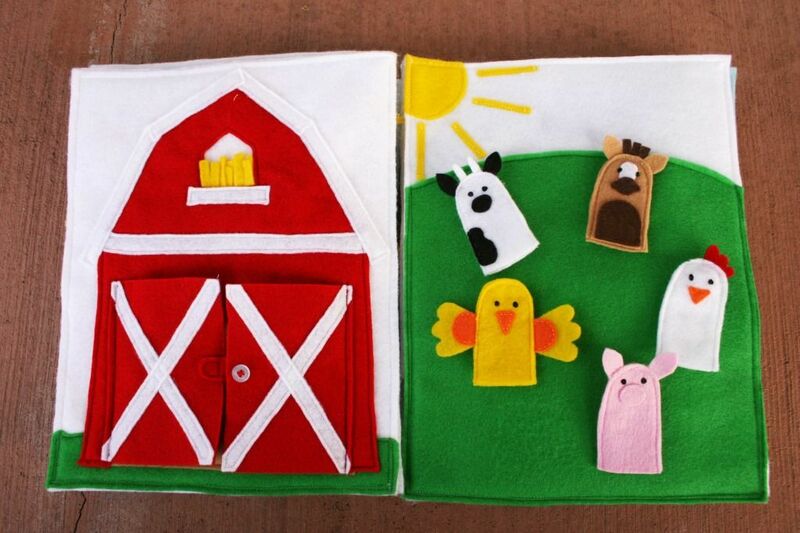 I made this book for my daughter, Ellie. I made it while I was (very) pregnant with her; she's now 9 months old. I'd say intermediate. I've been sewing for a very long time, but I've never attempted anything too grand. Working nearly every day, my quiet book took me about two weeks. All in all, I'd say it took about 50-60 hours. 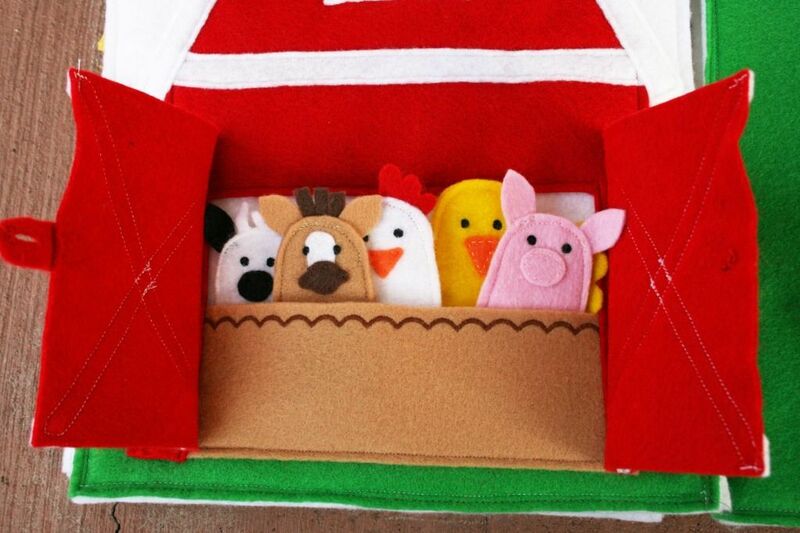 Yes, I used Homemade by Jill's templates for the barn and for the finger puppets, and Oopsey Daisy's template for the Mr. Potato Head page. 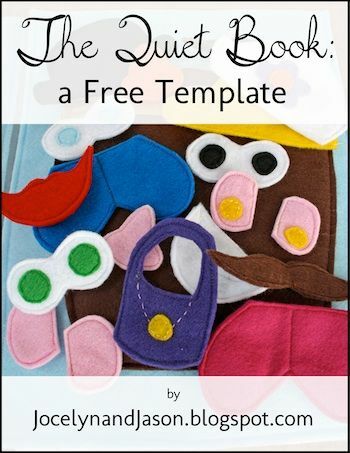 I have now personally made templates for this whole quiet book, which you can find here. 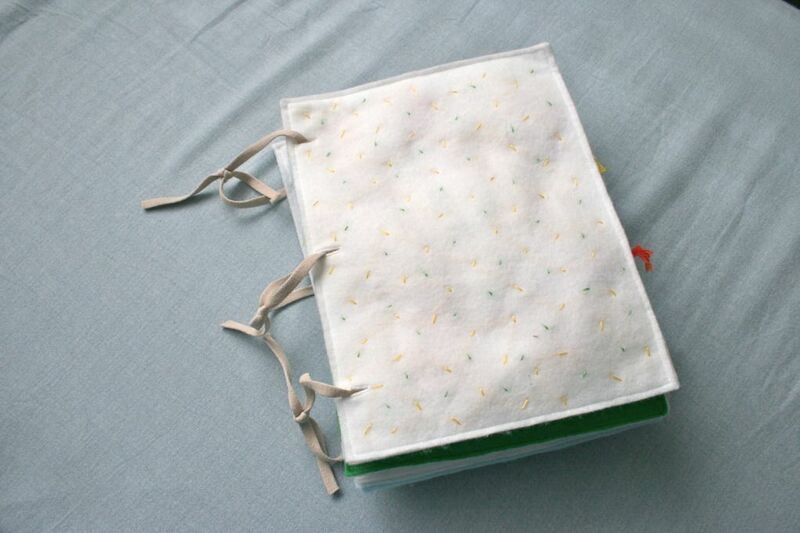 I sewed three button holes in each page, and then cut up and tied some shoelaces to make loops. 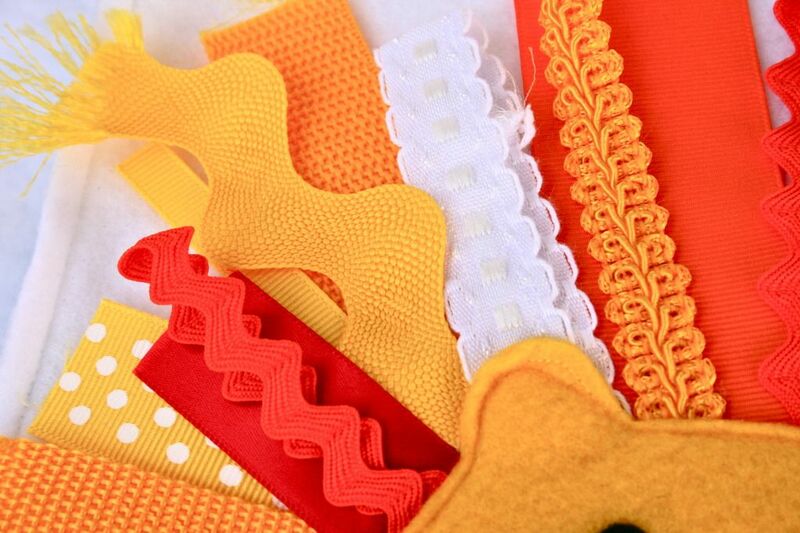 Pretty much everything is made of felt, but I also used ribbons, some printed cotton fabric, a zipper, various color threads, snaps, and velcro. 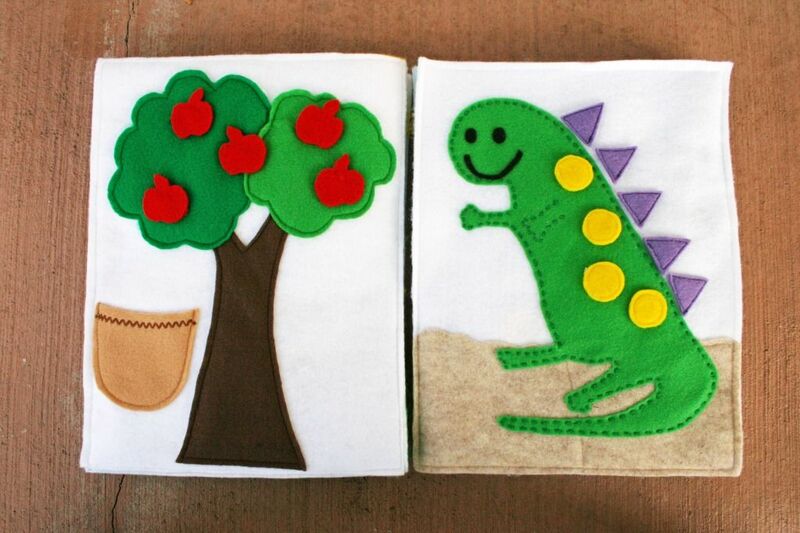 My favorite page is the dinosaur, because it's the one I made up entirely by myself. He's just so happy! 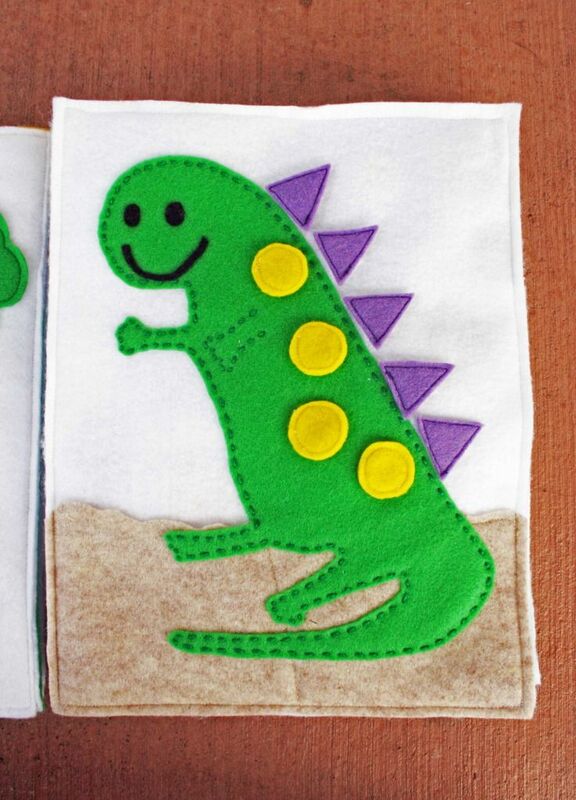 Happy dinosaur. 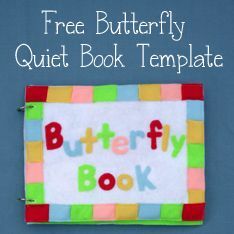 This whole quiet book can be found (in more detail; each page has its own post) on my personal blog at Sunshine, Lollipops, and Rainbows. Have you made a quiet book that you'd like to share? 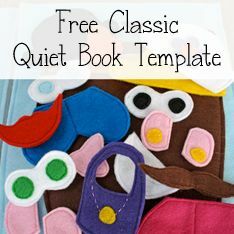 Click here for instructions on how to submit your quiet book! Jocelyn, Love you book. I see that you used felt for the page background. Did you just use regular felt or did you use the stiff kind? Now having made it and used it (a little) would you use the stiffer stuff instead? Just for the page backgrounds? I'm nervous about using white as the background...has it gotten dirty/grimy looking? You know, it has gotten a little bit dirty. I haven't tried washing it yet, though, and I think it'll get very clean just in the sink with water and dish soap. I can't see the pictures anymore....is there somewhere else I can see them? Thanks! One More Question. 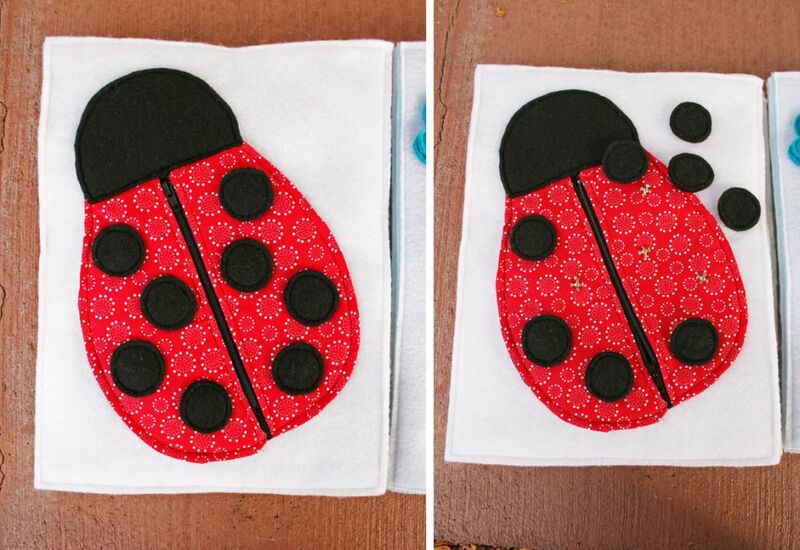 :) On The Lady Bug, Did You Cut Out The Wings In Black Felt And Then Do The Red Fabric On Top Of That, Or Just The Red Fabric? can I ask a really silly question! 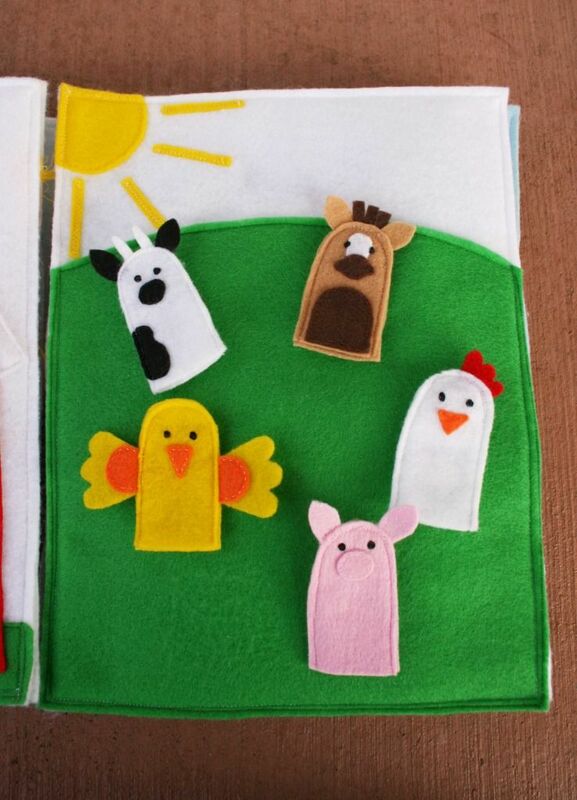 do you sew the felt pages right side together and then turn and stitch the gap...or do you just place the pages as it ie, right sides out, and then just do a top stitch around to make the front and back pages stick together. 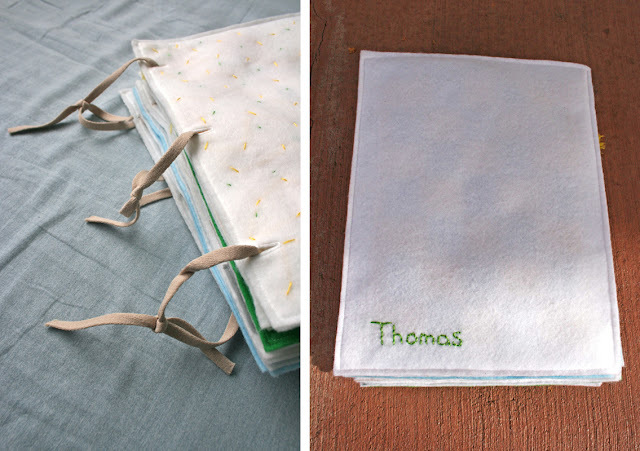 I have seen another book made with muslin pages, but I think I like the felt pages better. Do you happen to have a pattern for the 2nd page of the car page. Specifically the car and the garage? I've made my attempts but they don't look like cars. 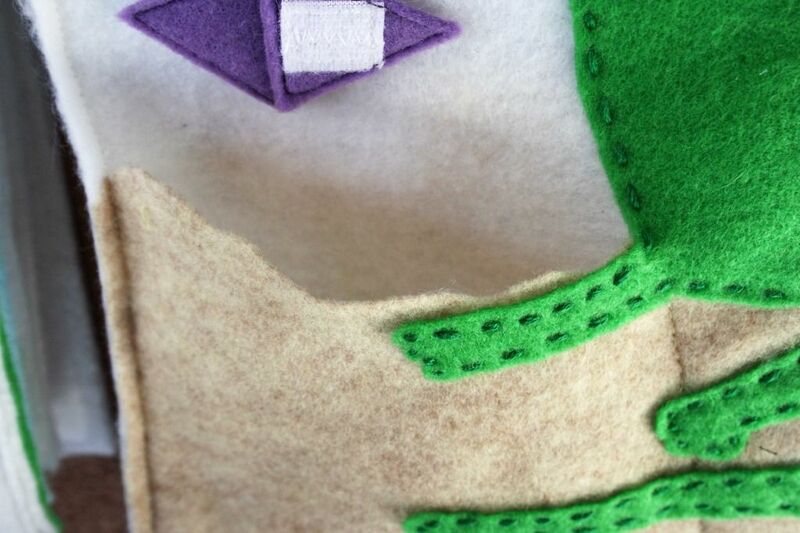 Ok, new question- for the pages that you need to velcro pieces to, how did you get the velcro to stick? I tried just sticking it on and it pulled right off, I tried glueing which seemed to work but took extra time. 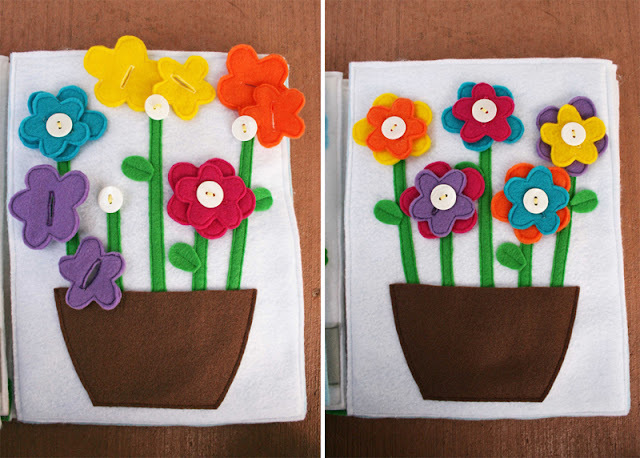 I didn't want to have to sew the velcro onto the pieces or book because they're often decorative pieces. Also, how did you get the previous page to not stick to the next page that has velcro? I used all felt for my books and if I didn't keep the pieces on the pages, the pages stuck together. I'm afraid the velcro will come right off if a child would try to pull the pages apart. I am giving them as gifts so will just put all the pieces on so they know what to do, but when they take them off to put the book away the pages will stick together. Any ideas how to deal with this? Just put a blank felt page in between all the pages? The link does not seem to work anymore. I would love to use some of your templates, do you think you could fix it? Thank you so much! wow such a great resource! 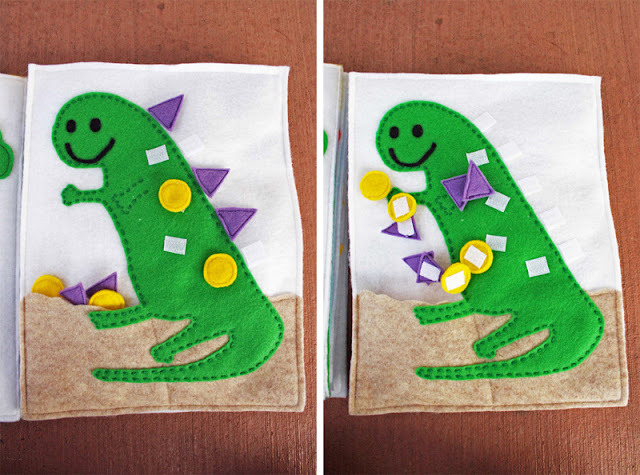 Thanks for sharing your hints, tips, patterns and templates! Hi, great page. 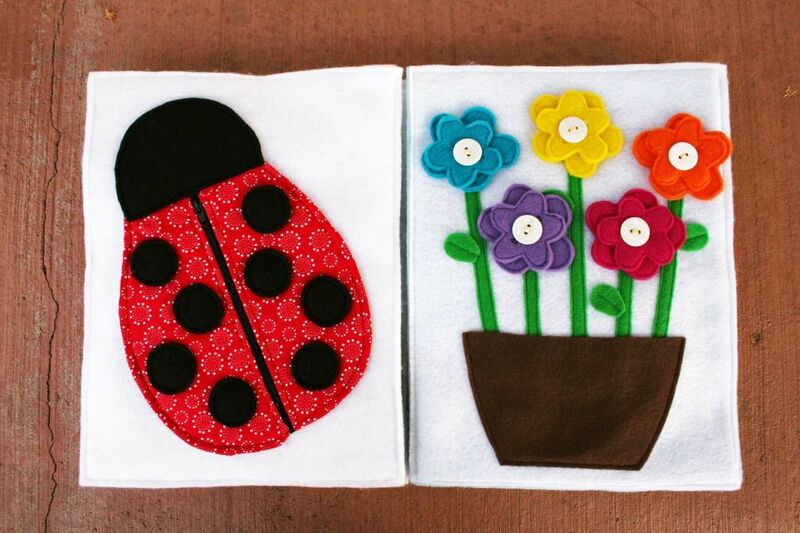 Making one for my daughter right now using yours as an inspiration. May I know what's the length and width of the page, please? Hi! 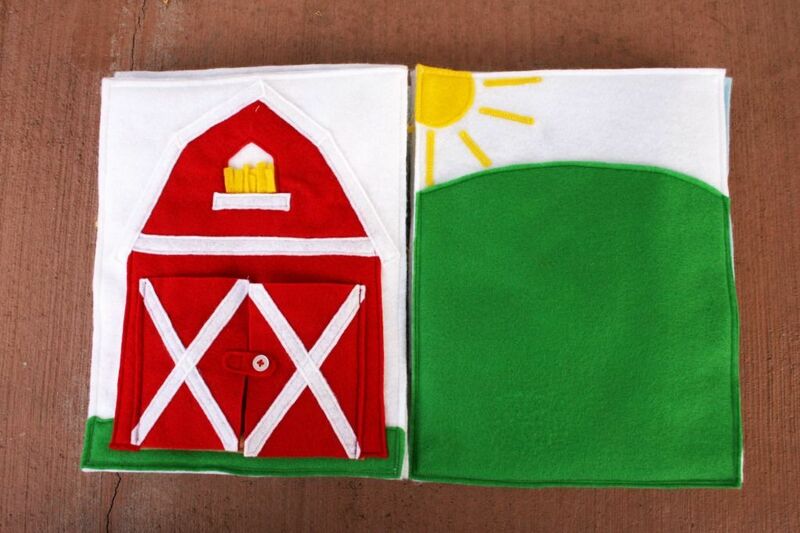 The sheets are the precut kind from the craft store; they're about 9 inches wide and about 12 inches tall. Jello, great book. My question is what size is each page. 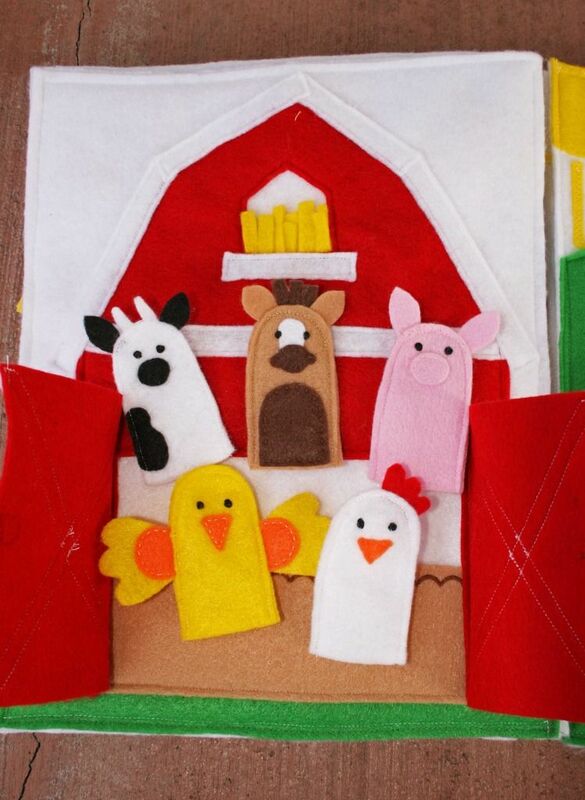 it looks like a sheet of felt (9x13) but, I was wondering if you used the precut sheets or if you bought felt by the yard. witch would you reccomend? thank you! Thank you so much for sharing your awesome templates! 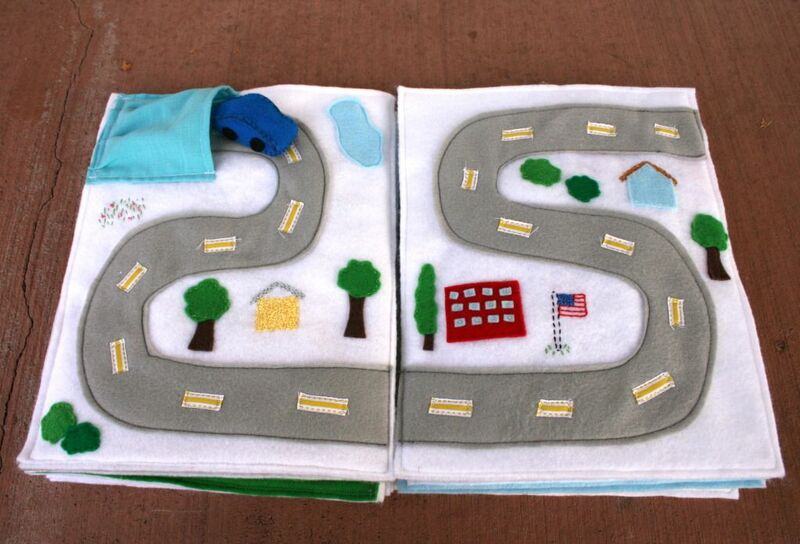 Would you mind sharing how you made the car and car pocket? 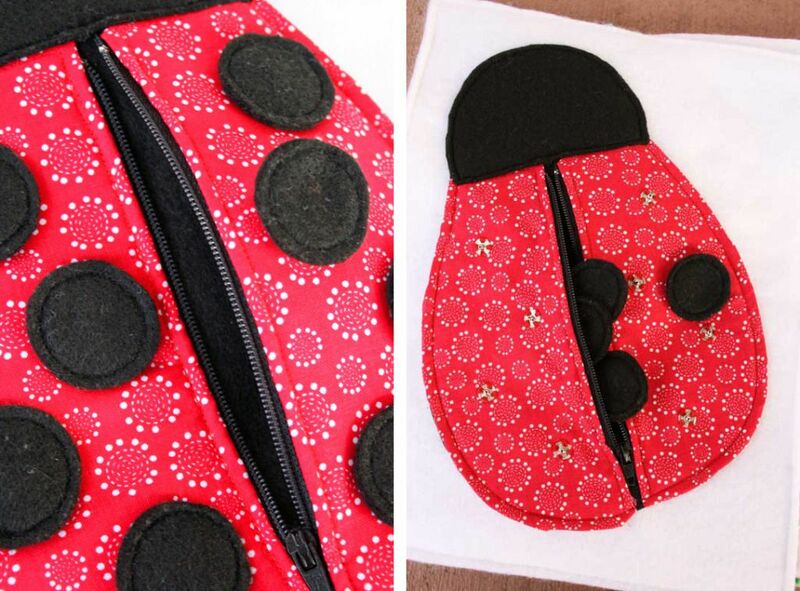 Also wondering what you used as a fastener for the dots on the ladybug? Is it just snaps? I can't seem to tell. Thanks again! 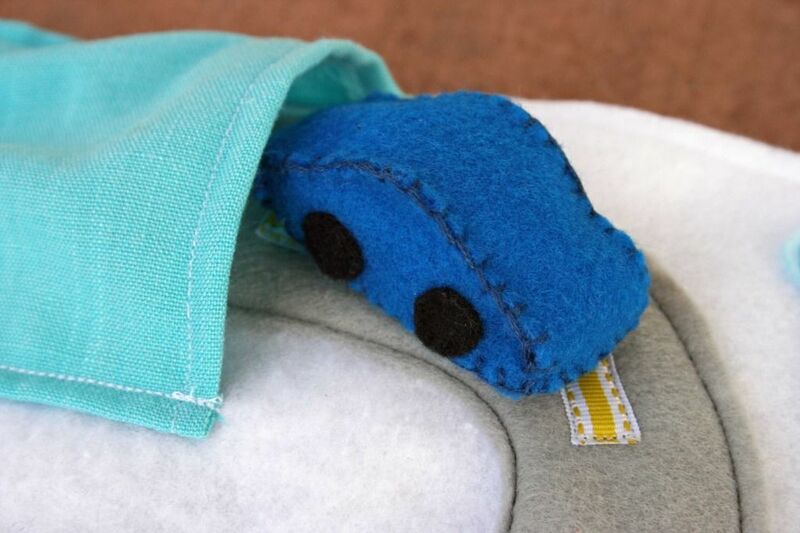 I sewed two wheels to each car-shaped side piece. 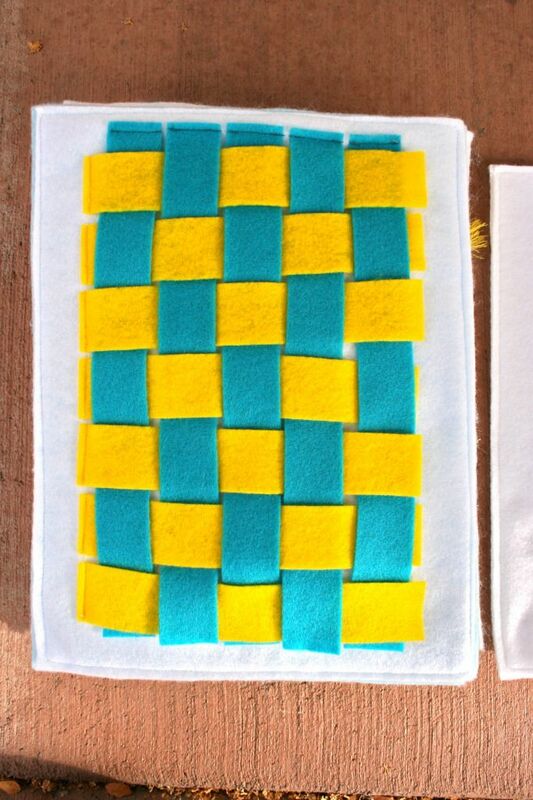 I then stitched the two car-shaped side pieces to the long top piece, and then stitched the bottom piece on the bottom. Before I sewed all the way around, I stuffed the car with cotton. I would recommend stuffing the car with a lot of cotton, as it tends to get kind of squished. After I filled it with cotton, I finished sewing all the way around on the bottom. To make the pocket, I just cut out a rectangle of fabric and sewed it on the page, making sure that the car would fit inside. I just discovered this today, too, and am loving the look of it. 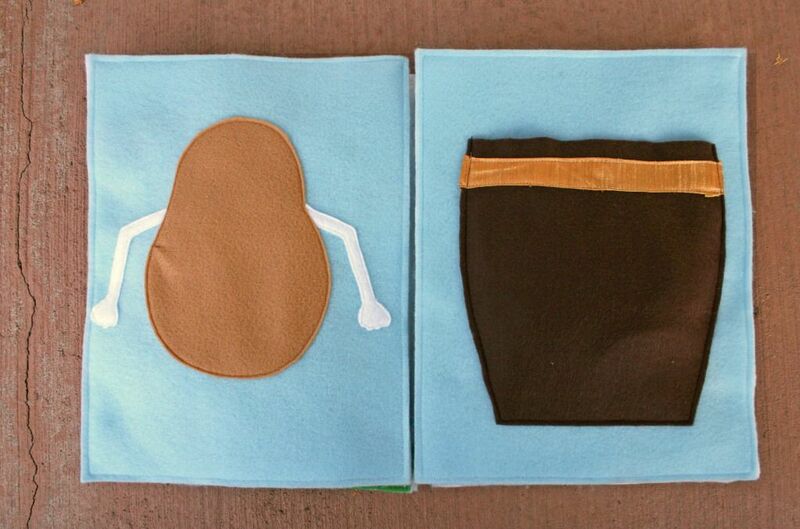 I think I'll make one for my grandson. Hi I am making a similar book. 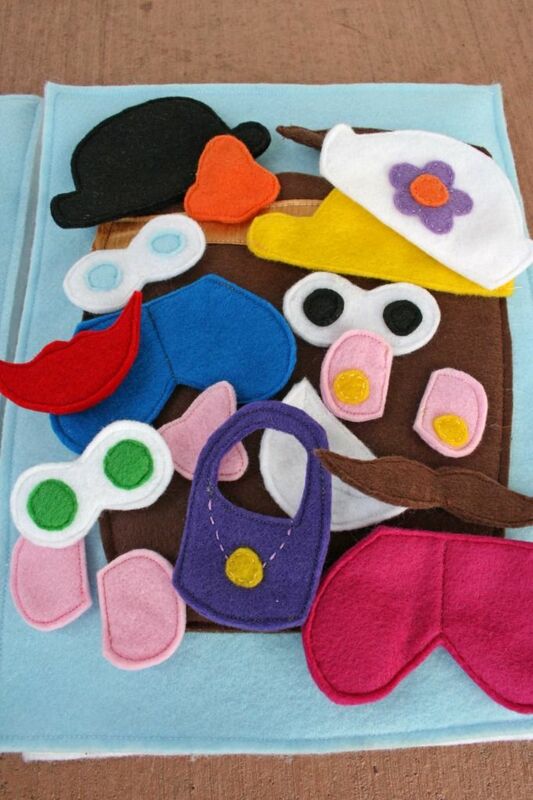 I was wondering, did you double up on all of the felt pieces with snaps or Velcro? 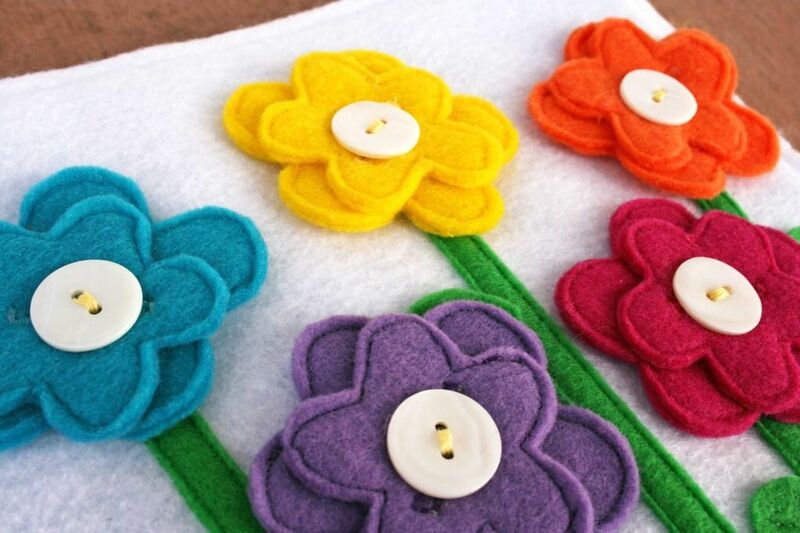 And did you sew the Velcro with a machine? Hi Brooke! Yes, I did double up on those pieces for durability. And also yes, I did sew (most of) the velcro with a machine. Velcro is really hard to sew by hand, haha! 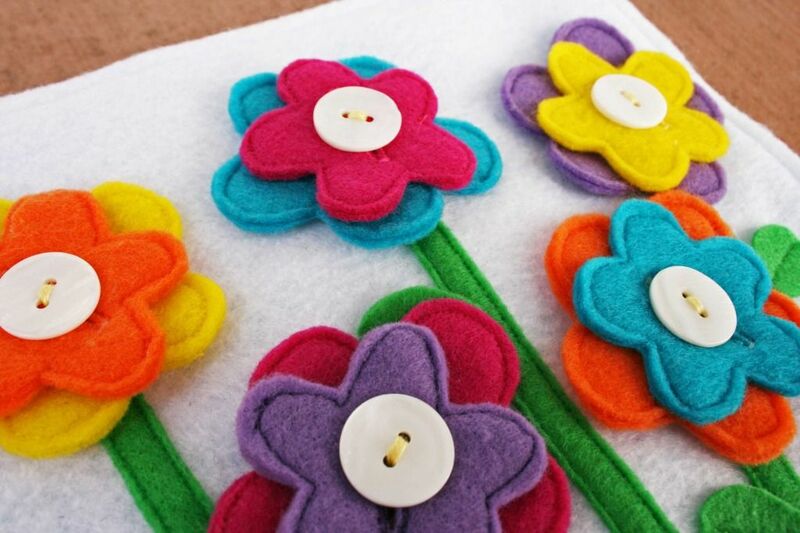 Any tips on making button holes on felt? My sewing machine is having a hard time. I'm thinking of just doing it by hand. 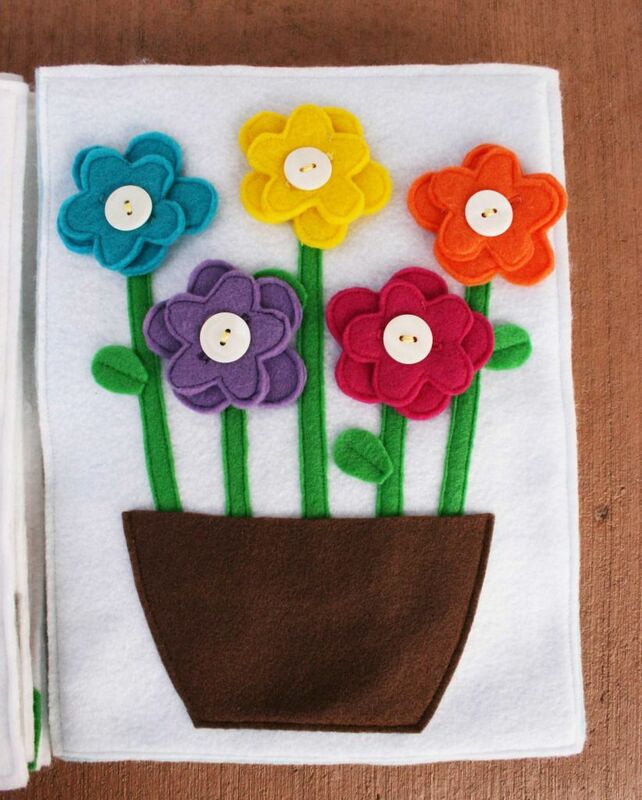 But I'm going to be doing your flower page and I haven't been able to get it to work with my machine. Hi Ashley! Sorry, I don't have any tips; I just do them with the button option on my sewing machine. I'm sorry I can't be of more help! Love this - I looked at EVERY one of the quiet books - couldn't stop. They have evolved. But love is still the main ingredient. Am even more impressed that you have done this for so long. hi, i love your work! Do you actually sell the book? I really has got no time and no skill in sewing. How much felt (precut) do you think I'll need to do this book. 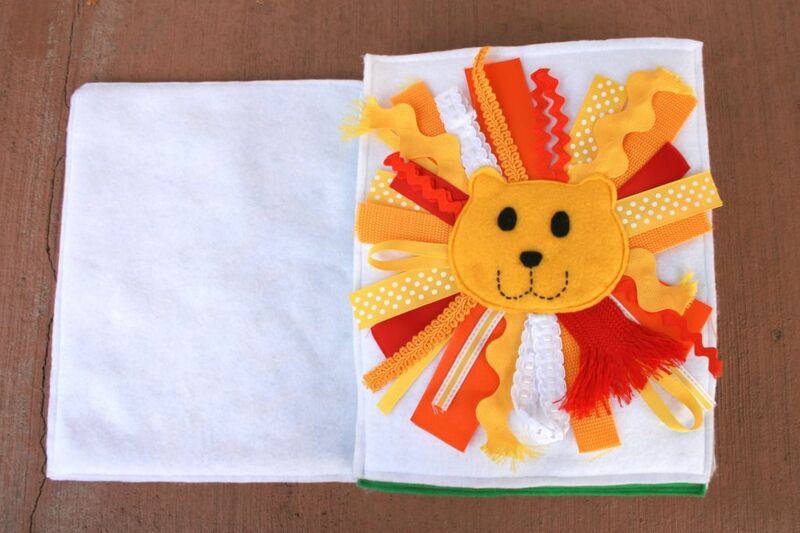 I want to make it for my 8month old for Christmas. Hi, this is brilliant. Question. 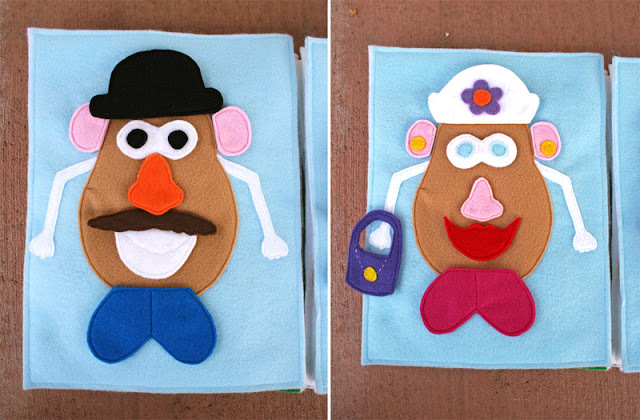 Do you stitch the pages back to back, what happens then if you want to take one of them out to change it? Great book and great ideas! Thanks for sharing. It's fantastic design!! Very nice book, all the scenarios are great to small kids. Great idea, thanks for sharing! Hello. Beautiful ideas. Is it ok to make books with your designs and sell them?